2. 2. Demonstrates proper care and safe use of materials and tools. 3. 3. Identifies and discusses the properties of color. 4. 4. Identifies and discusses color schemes (e.g. complementary and neutrals). 5. 5. Creates artwork using the following color theories (e.g. complementary and neutrals. 6. Creates artwork portraying an object, subject, of themes from different points of view (e.g. close up, below and above). 1. Produces artwork in a variety of subject matter and in the area of drawing, painting and mixed media. 2. Researches and applies regional history sources as ideas for original works of art. 4. Compares special concepts that show depth in artwork (e.g. Overlapping, placement, color intensity, and detail). 5. Recognizes how an artist creates a point of view in an artwork. 6. Creates artwork using direct observation, lines, shapes and space, special concepts, balance and contrast. 1. Emphasizes specific elements of art and principles of design and selects materials and techniques appropriate to creating an artwork based on own idea and self-direction. 2. Uses available technology to produce artwork. 3. Develops criteria for sorting artworks into categories of landscapes, cityscapes, still life’s, seascapes and portraits. 4. Develops and applies criteria for judging personal decisions about artworks. 5. Discusses an artist purpose for using line, shape, and color to capture movement in artworks, such as gesture drawings, action painting and mobiles. 1. Explains how space and shape can be positive and negative in a composition. 2. Examines selected artworks based on questions related to art theory. 3. Matches a description of a culture with an artwork representative of the same culture. 4. 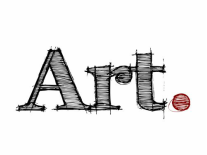 Generates accurate statements about the functions of particular artworks and the culture that produced them.